It's that time of the year when people suffer from Hay Fever (allergic rhinitis), why now? According to Ayurveda, an allergy is the aggravation of a Dosha by a particular substance (the allergen). 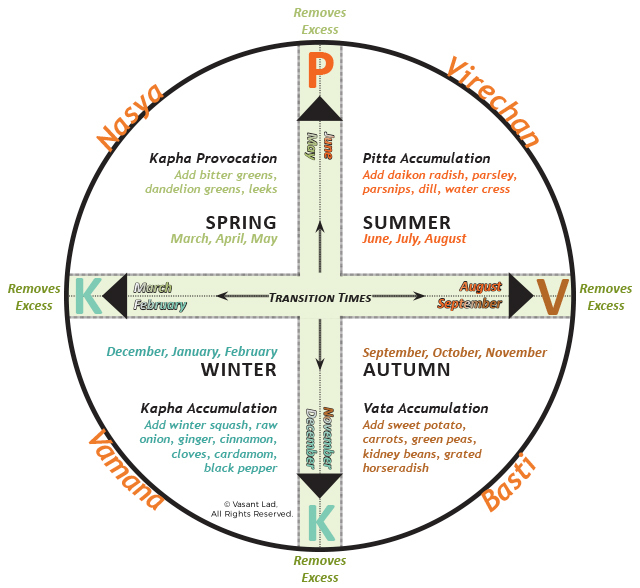 In most cases, allergic reactions are reflective of our Doshic constitutions, for example, a Kapha predominant constitution will present a Kapha type allergy, especially when this dosha is already aggravated (like in spring). Hay Fever (Allergic Rhinitis) generally occurs due to Ama, decreased immunity and Vata/Kapha imbalance which are particularly aggravated in spring. Yoga and pranayama can help to reduce allergic reactions and build stamina, immune system to fight off the disease. Yoga improves lung capacity and helps draining mucus from the respiratory tract. Practices such as Kapalbhati Pranayam, Anulom Vilom Pranayam, Vrukshasan (tree pose), Virabhadrasana (warrior pose), Trikonasana (triangle pose), Bhujangasana (cobra) Pavanmuktasana (gas releasing pose) and Shavasana are all poses that help. A diet to follow is one that balances Kapha and kindles Agni to burn ama. A quick look at allergies by type. Vata types of allergies are often experienced in the digestive tract: gas, abdominal pain, intestinal colic, etc. There might also be symptoms of headache, a ringing of the ears, joint pain, insomnia, and other typical signs of Vata imbalance. When Vata is aggravated, it is important to slow down, keep warm, stay hydrated, and have a vata pacifying diet and life-style. To help with Vata imbalance and this type of allergies, drinking ginger, licorice teas with an added drop of ghee can often be helpful. Pitta types of allergies are more related to skin problems, such as hives, itching, eczema, dermatitis, etc. You might also experience heartburn, nausea, indigestion, and other symptoms affecting the GI tract. When Pitta is high, you might experience sensitivity to spicy, hot food, sour fruits, fermented foods, and nightshade vegetables. A Pitta balancing diet and lifestyle will help counteract this effects of high pitta. Keep cool, eat non-spicy food, avoid overheating. Ayurveda also recommends bloodletting, blood donation. Coriander is a good blood and liver cleanser, you can either add it fresh to your food or drink its juice in the morning. Neem oil has cooling proprieties, its application relieves excess pitta. Kapha allergies are most likely to be experienced during the spring season when plants and trees shed their pollen into the atmosphere. When pollen is inhaled, can irritate the delicate mucous membrane causing an allergic reaction such as hay fever, colds, congestion, sinus infection, and even asthma. Other aggravated Kapha symptoms include water retention, bronchial congestion, caught, sleeping disorder and sluggish digestion. One way to minimize the effect of pollens is to lubricate the nasal mucous membrane with ghee (Nasya), to create a barrier and preventing direct contact with the allergen. There is also some Kaphagenic food that its best to avoid: milk and dairy, wheat, cucumber, and watermelon. Drinking lightening and clarifying teas such as ginger, cinnamon, cardamom, or clove can also help to liquefy, dry, and eliminate excess kapha. (we always work on opposite gunas). Using local honey as a sweetener helps reduce sensitivity to pollen, it is also the only sweetener we can use to balance Kapha, having the quality of light, dry and heating. Trikatu is often used to pacify Kapha and it is recommended to follow a kapha pacifying diet and lifestyle. Ama accumulation is considered to be the main cause of allergic rhinitis and virechana (herbal purgation) is a detoxification therapy often prescribed for this condition. Ayurveda recommends a cleanse during springtime, this also helps prevent Kapha type allergies. Intermittent fasting can be continued throughout the rest of the spring.